Passionate people, passionate places is the slogan adopted by the North East Tourist board. Whilst the friendliness of the people, the breathtaking rural views, the coastline and the many Cathedrals and Castles remain as inviting as ever the North East has also added a number of attractions over the years. GATESHEAD MILLENNIUM BRIDGE - The world's only tilting bridge it was built to enable pedestrians and cyclists to cross the River Tyne but at the same time enable passing ships to move up the Tyne. 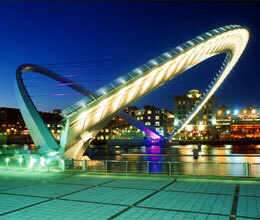 It links Gateshead with its famous attractions of the Sage International Music Centre and the Baltic Centre for Contemporary Arts building with the bars and restaurants on the Newcastle Quayside. Stretching 126 metres and weighing 800 tonnes it costing £22m to build and takes 4.1/2 minutes to tilt. The first time it tilted was on 20th November 2000 and it is such a popular and spectacular site that it now tilts at a regular time each day. ANGEL OF THE NORTH - Unveiled in 1998 and rising over 20metres high with a 54 metre wing span this is arguably the most famous North East symbol. 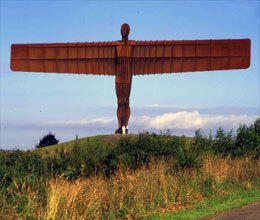 Built on a site previously occupied by a colliery, the Angel is seen by over 90,000 people a day from the A.1 and the mainline railway line. 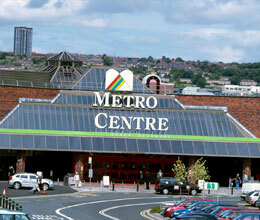 METRO SHOPPING CENTRE - Europe's largest shopping and leisure centre with over 330 shops from independent specialist craft shops to large department stores, 50 restaurants, Europe's largest indoor theme park, Megabowl, 11 screen cinema and Quasar laser centre. 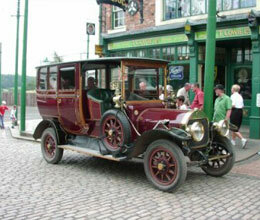 BEAMISH OPEN AIR MUSEUM - This Award winning museum captures the spirit of Edwardian North East. Take a tram ride back in time to 1913, past the colliery village, peep into each house for wash day: baking day etc or explore the town with its 1913 dentist, music teacher, sweet shop, garage, co-op, newspaper, stables. You can visit an authentic manor house or the home farm or school or experience going down into a coal mine complete with a hard hat. An enjoyable educational day out for all the family. 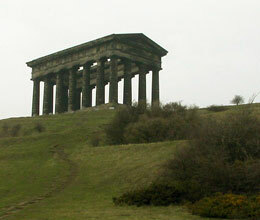 PENSHAW MONUMENT - The monument was built in 1844 from funds raised locally in honour of John George Lambton, 1st Earl of Durham. Built on a hill and illuminated at night it can be seen from miles away. HADRIAN'S WALL - Built AD122, on the orders of Roman Emperor Hadrian, for defensive purposes, the wall is one of the best preserved Roman remains. 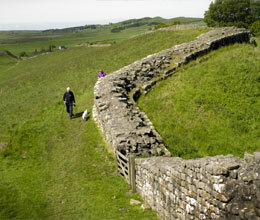 The wall is 80 Roman miles long (117 kilometres), 8-10 feet wide and 15 feet high. It stretches from Wallsend in the East to Bowness on Solway in the West and took six years to build. When it was built it had over 80 forts, the remains of which can still be seen. 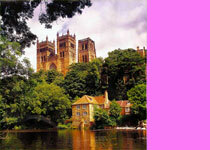 An interesting mix of coast, cities, shopping and country areas there is something for everyone in the North East.